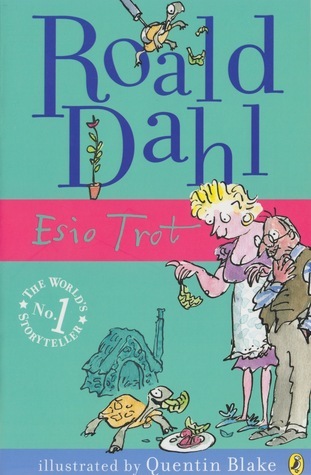 2015 Reading: #3 Roald Dahl’s Esio Trot – It's Time to Read! Mr. Hoppy is in love with Mrs. Silver, but her heart belongs to Alfie, her pet tortoise. Mr. Hoppy is too shy to approach Mrs. Silver, until one day he comes up with a brilliant idea to win her heart. If Mr. Hoppy’s plan works, Mrs. Silver will certainly fall in love with him. But it’s going to take one hundred and forty tortoises, an ancient spell, and a little bit of magic. This is the first book from my Roald Dahl challenge. I love Roald Dahl books! This book has just been adapted by the BBC for some Christmas viewing, so I decided I needed to read the book before I watched it. It is 50 pages long, but an enjoyable 50 pages. Easy to read, lovely story and I loved the illustrations by Quentin Blake. This is a children’s book, but one I thoroughly enjoyed!